Aspen was the first to speak, all of us still slightly in shock at what we had just witnessed. “We have to clear out the house. I don’t know if all of them left, or if some of them got in, but we have to know for sure,” he said, the urgency in his voice clear. “I’ll take upstairs,” I responded immediately, wanting to get a familiar perch from above, and recalculate our current situation. The fire still burned in the pit in the entryway, illuminating the three of us as I walked up the curved stairs. I quickly lost sight of them, the wall turning smoothly into a hall. The hallway was covered in shadows, the dying embers of fire pits casting light through the open doors of the rooms. “Hello,” I called out weakly. I didn’t like the idea of going blindly into each room, possibly ambushed at any moment. It would be better to draw them out into the hall, and cut them down as they ran towards me. I waited, my body tense and fluid at the same time, ready to spring if needed. But nothing came. I spoke louder a second time, my ears straining as my voice traveled down the hall. Once again nothing came out of the rooms and I walked forward, entering each one and searching every corner, my rifle always ready. A few were bedrooms, which I frowned upon. It was a bad omen to have bedrooms aboveground. It was obvious that the townspeople had become lazy. I entered one more room that was a study, a desk crammed into the corner, covered in books. Even in the most stressful situation, I found myself becoming excited at the plethora of reading material that was before me. It was rare to see one book, let alone dozens. The last thing in the hallway was the stairs leading to the final floor. Once again I walked the smooth curve of the stairwell, the stone giving off a sense of protection, although it would do nothing to help me if I was attacked by the infected. It was dark down the long hallway, only one room at the far end giving any light, the rest of the doors closed. Once again I called out and waited, keeping my eyes on the farthest room. I was greeted only by the sound of my own voice. Taking a breath, I pushed open the closest door, holding my gun out in front of me. I knew the moment I stepped in the room that I was not alone, there was a presence in the room, a presence in turmoil. I could almost hear the chaotic thoughts, trapped and angry. 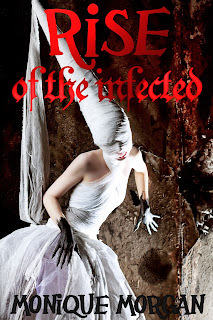 I knew when I heard the low animalistic growl, that I had walked into the room of one of the infected. My shoes slipped on the floor as I walked towards the sound, a trail of blood beneath me, as though someone had dragged themselves to the door and shut it. I walked around the bed towards the continued hissing, expecting the creature to come sprinting at me. But it remained in the corner. I walked closer, and finally saw white gleaming eyes as it stared at me, a hideous grin on its face. It was a woman, or what was left of a woman. These rooms were bare compared to the extravagant rooms below. I could only imagine the ones belowground. Logic would say that they belonged to servants, possibly even slaves. It was clear that even with the thick window covering the rooms would quickly get hot during the extreme heat. It would be torturous to be forced to live up here. On a beautiful day like this, they had all probably had their windows open, the first to succumb to the plague that had been dropped upon us. I almost tripped over the two severed legs that were littered on the floor. It looked like someone had taken an axe to them, and the brutality of the scene shocked me. Instead of dying, the woman’s wounds had almost healed, the blood stopping its flow. The growling increased as the woman dragged herself by her arms towards me. Her mouth had started the rabid chomping that seemed a telltale trait of the infected. Bloody fingers reached for me, just as I lifted the rifle once again and placed it to the woman’s temple, pulling the trigger with a quickly flick of my finger. I wiped the blood from my boots in the hallway, leaving a creepy trail of red footprints. There was one more room before the open one at the end, and my hairs rose as I pushed open the next door. I was greeted by silence, the room empty. Even the shutters were closed, and from the dust on the furniture I could tell it had been some time since anyone had been here. I moved back out into the hall and walked towards the last room, the light was not coming from a burning pit but from an open window, the sun shining into the room. My trigger finger tensed once again, concentrating on everything in front of me. The first thing I saw was the bed, covered in blood. Another servant was there, axe marks evident on her body. But this one was clearly dead, its head lying a few feet from the body. “I doubt you will be getting up,” I said, and that’s when I realized there was someone else in the room. It was another woman, her hair dark and her clothes fine. She was not some servant, but a mistress of the house. She was young, not much older than I was, and she carried an axe that dripped blood onto the floor as she stared at me. 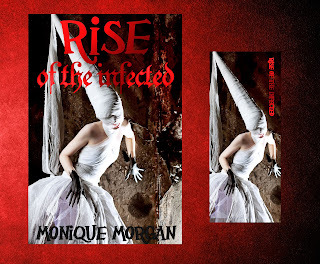 Here is a chance to win signed swag and a free e-copy of Rise of the Infected. A special thank you goes out to all the blogs participating in the Cover Reveal Blog Tour. Rise will be released October 31st 2012. 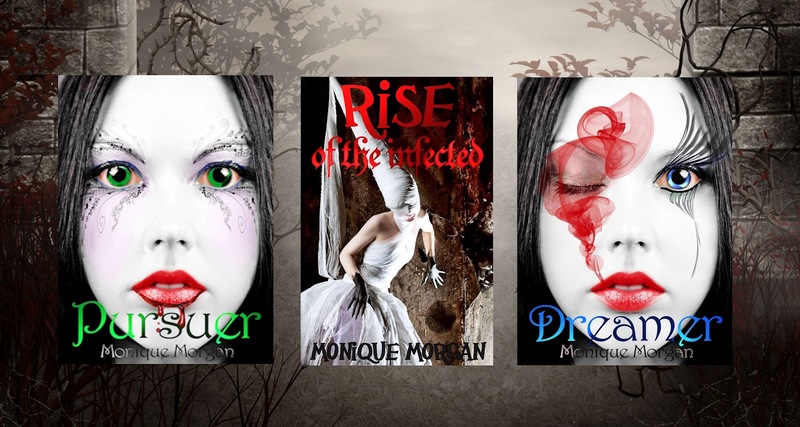 Win signed cover photos of all of Monique Morgan’s books: Pursuer, Dreamer, and Rise of the Infected. 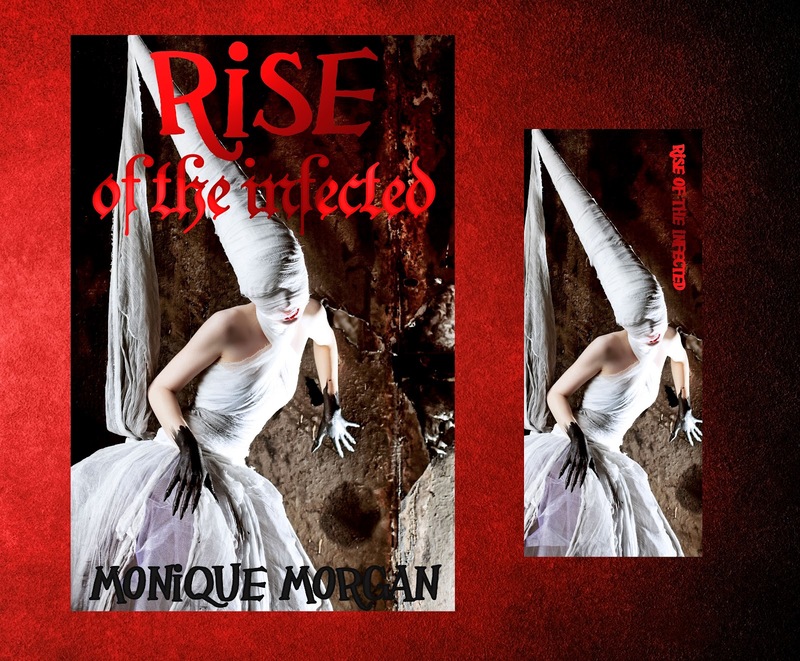 Win a e-copy of Rise of the Infected when it is released October 31st 2012, and all signed swag!